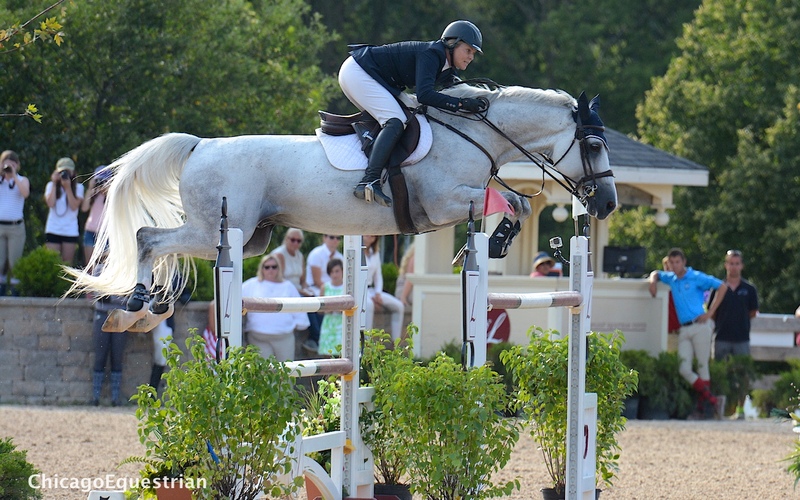 Tracy Fenney won the $50,000 Lamplight Grand Prix with Reve du Paradis. Photo Chicago Equestrian. 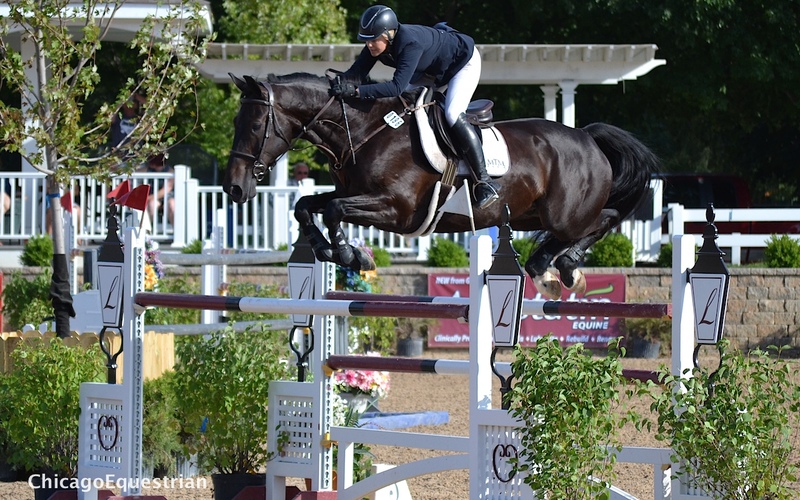 Wayne, IL – August 1, 2015 –Tracy Fenney was back on top of the leader board in Lamplight’s $50,000 Grand Prix during week two of Equifest, held at Lamplight Equestrian Center in Wayne, IL. 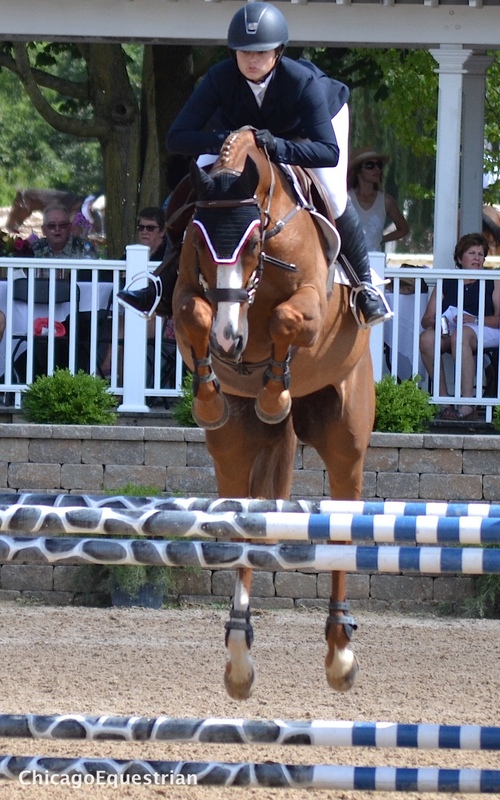 Fenney was the only rider to go double clear, a feat she accomplished with her relatively new mount, Reve Du Paradis. Fenney with her three rides and Andrew Kocher with his six, had the most chances for the check and it proved beneficial for them both. Tracy Fenney turned tight and galloped for the win. Photo Chicago Equestrian. Leopoldo Palacious created a track that challenged riders with only four horse and rider combinations making it to the jump off. Fenney had two of those rides, Lina Rojas and Andrew Kocher also had chances at the jump off track. It was an oxer, vertical, oxer combination that saw the most rails and Fenney admitted it posed a bit of challenge. Tracy Fenney and Dumbedorf. 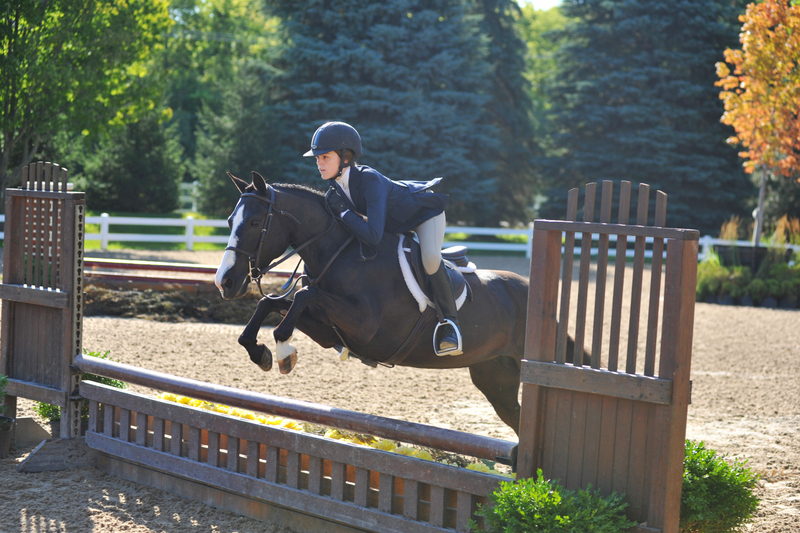 Photo Annie Weeden/Chicago Equestrian. Kocher returned first with Bologna and set a scorching time of 37.531 but had 12 faults. Kocher had a profitable two weeks at Equifest, winning the $10,000 Welcome Stake on Wednesday and the $75,000 Lamplight Grand Prix during Equifest I among other wins in the meter classes. Fenney then had her chance and set the bar high with a clean round on Reve Du Paradis and a slippery time of 39.254. Lina Rojas aboard Ramdam de Dry. Photo Annie Weeden/Chicago Equestrian. Lina Rojas aboard Ramdam De Dry, jumped off with a time of 50.307 and eleven faults. Fenney went last in the jump-off with her second ride, MTM Dumbedorf, an eight-year-old they just recently purchased, and wasn’t concerned with beating her time, she just tried to go clear. It nearly worked, Fenney had a quick time of 41.320 seconds but an unfortunate rail with a skinny vertical falling for her only faults. “He’s still adjusting to my ride and we’re working on getting him in shape, and getting him acclimated to our time. Every time he’s just coming out with more and more horse. Today he was a little feisty and we really liked what we saw. When I knew we were winning, I just focused on going clean. The first couple of times we showed him he jumped about eight different ways, he really tires to correct himself. He’s a smart horse,” raved Fenney about her mount. Andrew Kocher and Bologna. Photo Chicago Equestrian. Fenney cashed in, taking the big check with Reve Du Paradis, owned by MTM Farm, and second with Dumbedorf, another MTM horse. Rojas ended up third with Ramdam De Dry, owned by Mauricio Retrepo and Kocher took the fourth spot aboard Bologna, owned by Shalanno Farms. Some of today’s riders have horses entered in tomorrows $30,000 Lamplight Jumper Speed Derby. The Derby will be designed by Leopoldo Palacious and will feature natural obstacles designed to test the horses and riders in a one round speed class. Emma Sargent and Winchester. Photo Annie Weeden/Chicago Equestrian. In the $7,500 Cavalor Show Jumping Hall of Fame High Junior/Amateur Owner Classic, Emma Sargent repeated her performance from last week and had the win. Sargent won last week aboard No Fear and this week on her own horse, Winchester. Sargent was the only rider of the twelve competitors to deliver a clean round. Winchester just returned from the Young Rider Championships where Sargent competed for Zones 3 and 6. Sargent has only had this mare for about a year and half and is already working toward the Prix Des States at the National Horse Show. “She came and did just this class this week. We’re trying to qualify for the Kentucky National and we’re only a few points away,” remarked Sargent. When asked about the course, Sargent admitted she found it somewhat difficult. “I thought the course was a little difficult. She (Winchester) helped me out a bit. The first line was a bit of question of whether to leave-out or stay wide and add a stride. I went to do the leave-out then changed my mind at the last second and she really helped me out,” said Sargent, who was also a little relieved to not have to do the jump-off. “She’s a little older she likes to do one round then be done, go back to her stall and relax,” added Sargent. In the $1,500 Low Junior/Amateur Owner Classic, it was another repeat performance for Caelinn Leahy of Maple Park, IL, who had the win aboard Kaner 88. 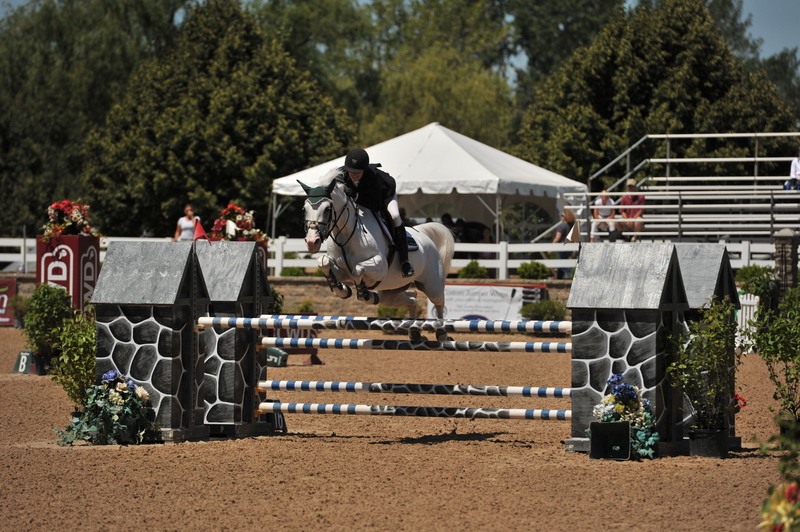 Leahy won Equifest I’s Low Junior/Amateur Classic aboard Kaner 88 as well. Celia Bresch and One Direction. Photo Andrew Ryback. In the $1,500 Child/Adult WIHS/NAL/M&S Classic, Celia Bresch had the win aboard One Direction for the Children’s section. For the Adults, Molly Struve took the first place spot aboard Clever Girl. Hannah Pattermann had the win in the $500 Low Adult Jumper Classic aboard The Speed Sheep. Natalie Jayne had the win for the Children’s section aboard Aro. Olivia Lawton and Cassandra Dreams. Photo Andrew Ryback. 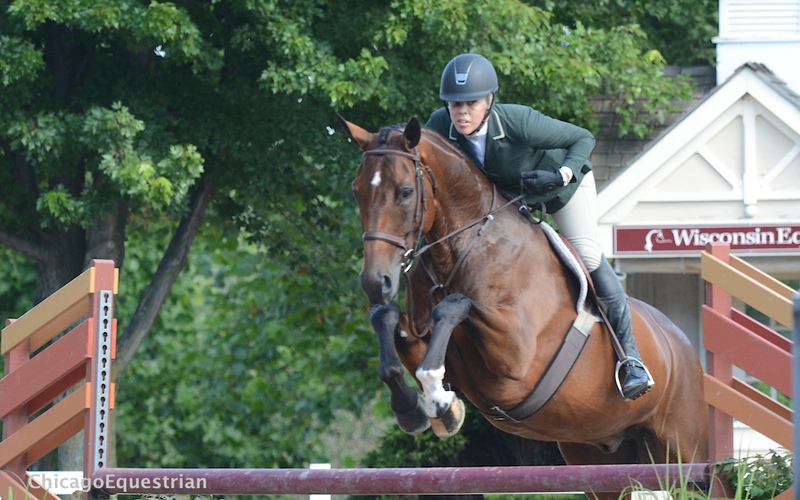 In the $1,000 Modified Junior/Amateur Jumper Classic, Olivia Lawton took top honors aboard Cassandra Dreams. 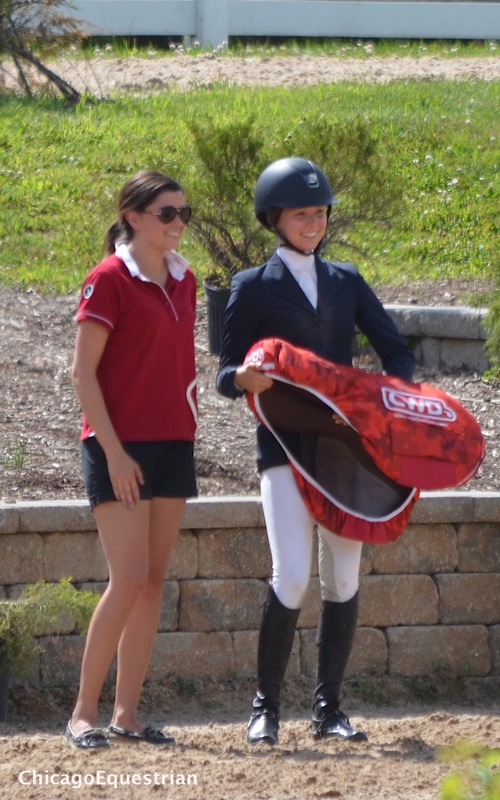 Reid Patton won a CWD saddle, presented by CWD representative Mallory Koplin, for being the Leading Junior/Amateur Jumper Rider during the two-week Equifest series. Jumper competition continues Sunday with the $30,000 Lamplight Jumper Derby at 3:00pm. 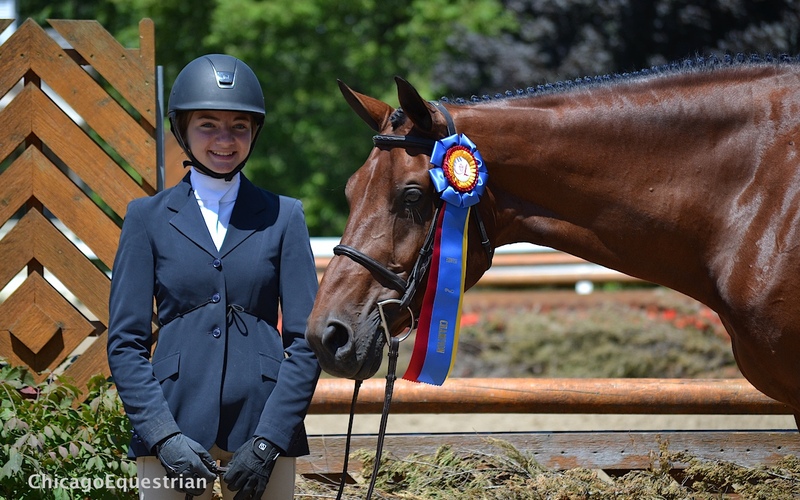 Division championships were awarded in the hunter divisions as the competition wrapped up at Lamplight Equestrian Center for Equifest II. In the 3’6” Amateur Owners it was MTM Passport and Therese Peck, Flower Mound, TX, winning all of the over fences classes and earning the Championship. Taking the Reserve Champion honors was Kalifornia and Heather Zuber, Zionsville, IN. 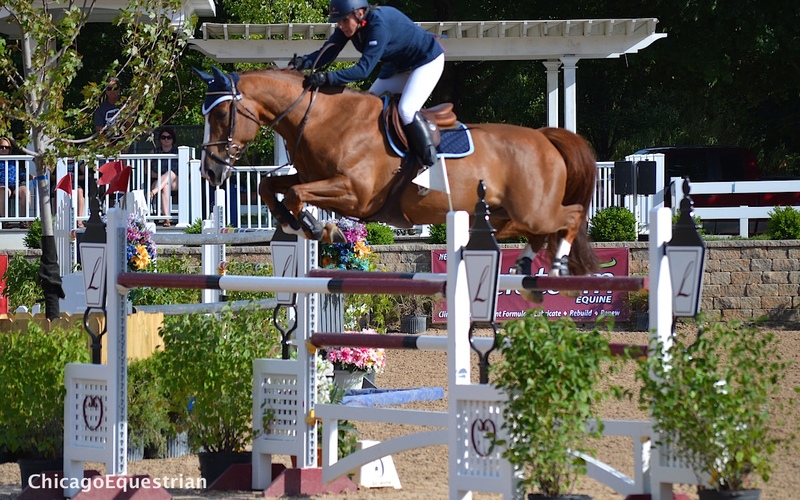 Reid Patton, Nashville, TN and Sincere took the Championship in the 3’3” Amateur Owner Hunters and Margaret O’Meara and Casino earned the Reserve Championship. Patton, 20 has had Sincere for about three years. When she first got him she thought he was the hardest horse to ride and now, thanks to trainer Cara Cheska, he is easy. “He was laid up for awhile and his first show back was Devon, where he won the first class and ended up Reserve Champion in the 3’3” Amateur Owners his first time back. 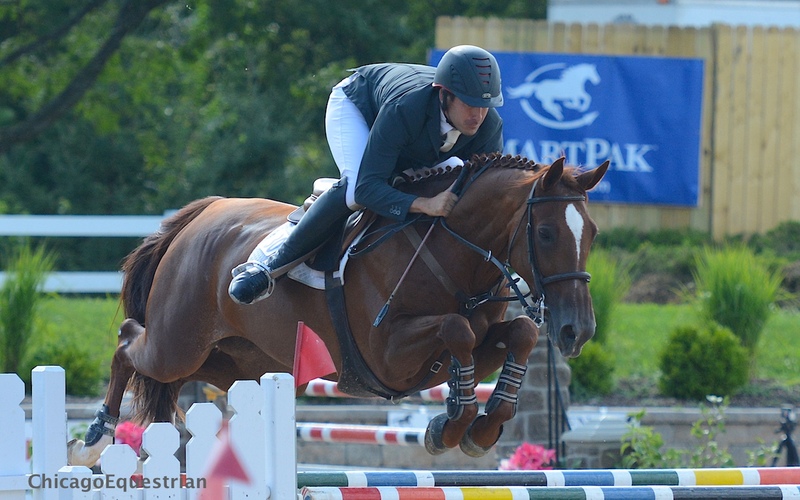 He’s been champion or reserve every horse show so we hope to qualify for indoors," said Patton. 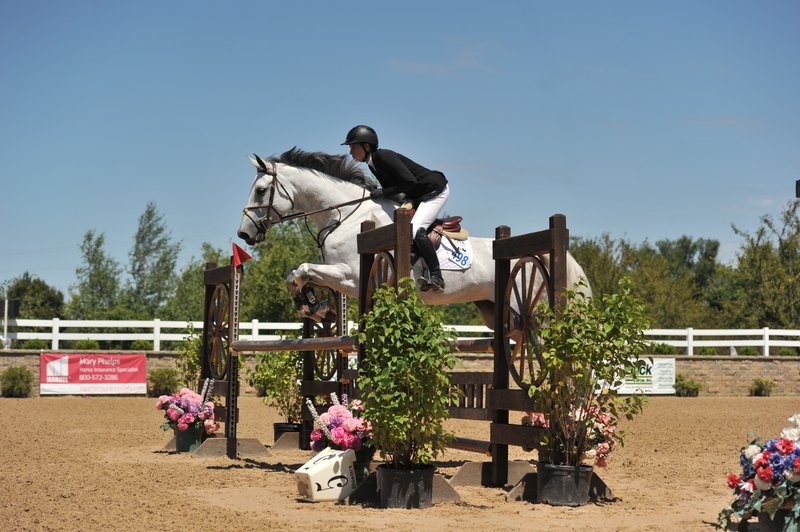 Olivia Lawton ruled the 3'6" Junior Hunters, earning the Championship on Gretzky. 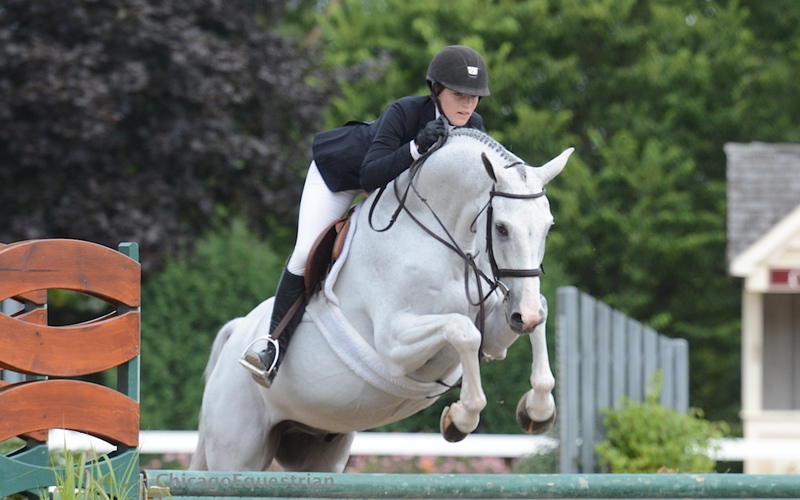 Photo Elizabeth Stein/Chicago Equestrian..
Olivia Lawton, Burr Ridge, IL, took the junior hunter division 3’6” by storm, earning the Championship with Gretzsky and the Reserve with Outlook. 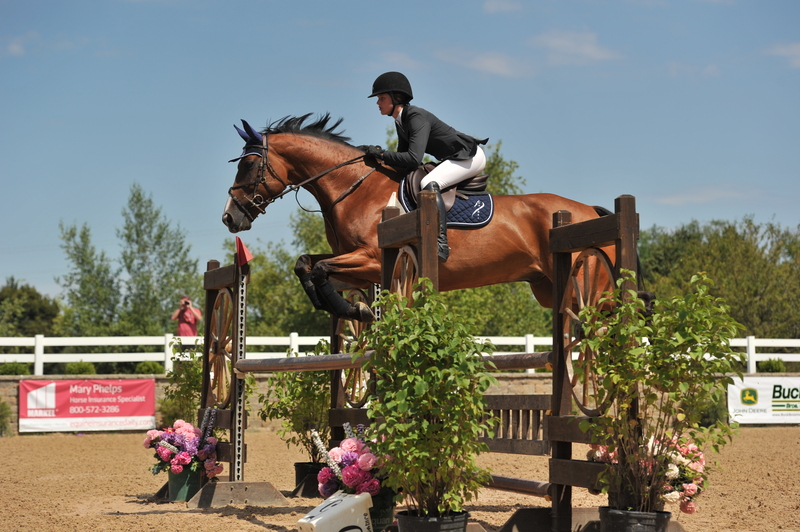 Becky Kozma and Hey Sailor landed the Championship in the 3'3" Junior Hunters. Photo Annie Weeden/Chicago Equestrian. In the 3’3” Junior Hunters, Hey Sailor, owned by Buffalo Therapeutic Riding Center with Becky Kozma in the irons, earned the Championship. Reserve Champion was a tie between Whenever and Isabella Baxter of Wright City, MO and Wonderful Look, owned by Sweet Oak Farm, Wellington, FL with Madison Arani aboard. 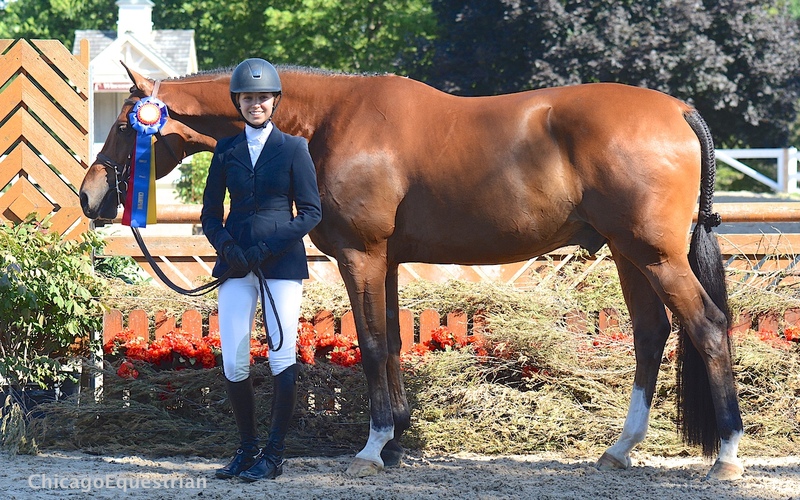 The Small Pony Hunter Champion was Apricity, owned by Emily Karp and ridden by Vivian Wiggins, Bloomfield Hills, MI. Reserve went to Firefly owned by Kat Fuqua and ridden by Coco Farish. Steal the Crowd and Natalie Jayne. Photo Elizabeth Stein/Chicago Equestrian. 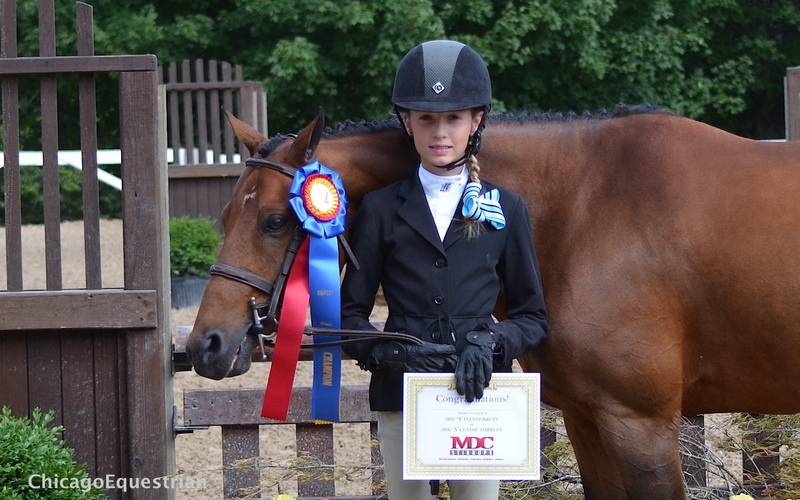 The Medium Pony Hunter Champion was Steal the Crowd owned by AKM Concepts and ridden by Natalie Jayne, Elgin, IL. Reserve went to Woodlands Blue Haze, owned by Jackson Brittan and ridden by Clayton Martines, Elgin, IL. 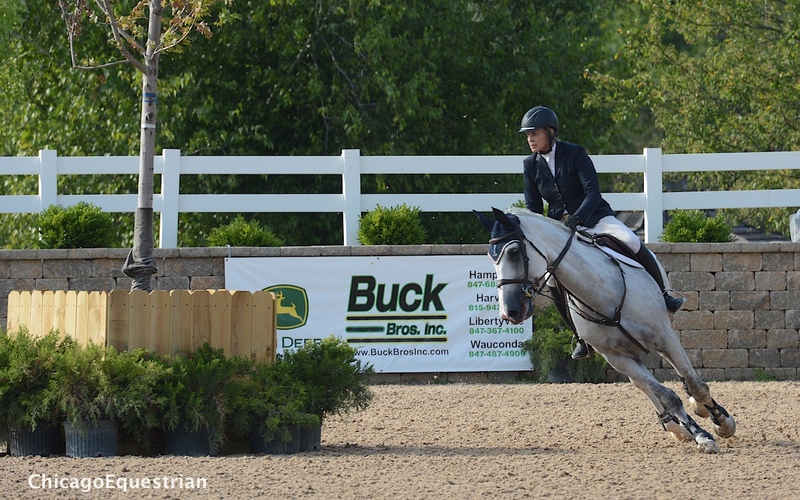 Hunter competiton finishes on Sunday with the grande finale of the $5,000 USHJA National Hunter Derby and the $25,000 USHJA International Hunter Derby. The premium show is a USHJA 2014 Member's Choice Award Winning Horse Show, rated by its members as an exhibitor friendly show and facility. For more information visit www.lamplightequestriancenter.com.